World travelers enjoy the sunset from the Sugarloaf mountain. Rio sites include: Jesus Christ the Redeemer, beaches Copacabana, Ipanema, Lebron, Botafogo, Maracana Stadium, Favela, Carnival and Samba. 360 video 2:1 aspect ratio for VR apps. Rio sites include: Jesus Christ the Redeemer, beaches Copacabana, Ipanema, Lebron, Botafogo, coastline, Maracana Stadium, Arches of Lapa, Cathedrals, Favela, Streets of Carnival and Samba, monuments. 360 video panorama 2:1 aspect ratio for VR apps. RIO DE JANEIRO - MARCH 19, 2016: Athlete holds Olympic flag at sunrise city skyline view of Copacabana Beach in celebration of the Summer Games. RIO DE JANEIRO - FEBRUARY 27, 2016: Pair of athletic young Brazilian women play keepy uppy altinho on Copacabana Beach. 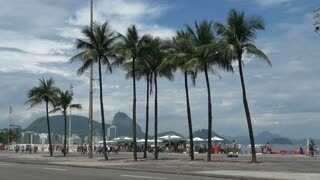 Beach Time Lapse Rio Copacabana Zoom v66. 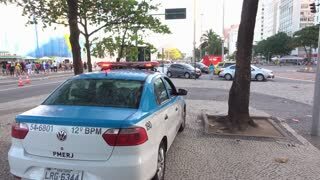 Zooming time lapse of Copacabana beach in Rio De Janeiro. Aerial view of Copacabana south Rio De Janeiro, Brazil. Shot in 4K. 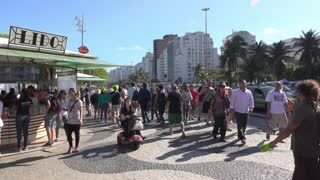 Copacabana Beach high angle street Time Lapse in Rio de Janeiro, Brazil. Clouds dynamic. A wave, off the coast of Copacabana, travels into shore - Rio de Janeiro, Brazil. Artistic sidewalk pattern and night shot in Copacabana.